Dowden Health Media, is a 16-year-old producer of medical journals, consumer magazines, newsletters and physician education programs. Lebhar-Friedman, Inc., Dowden’s parent company, was founded in 1925 and based in New York City, is the leading independent publisher and provider of information for the retail and foodservice communities and their vast supplier networks. Its retail and foodservice publications include: Chain Store Age, DSN Retailing Today, Drug Store News, Home Channel News and Nation’s Restaurant News. In addition to the retail and foodservice sectors, Lebhar-Friedman also owns FSA Group, based in Louisville, Kentucky, which specializes in association management for nonprofit and volunteer organizations, and has a presence in Europe, with offices in both the U.K. and Spain, and a joint venture in Japan. For more information, visit the company’s Web site: www.lf.com. 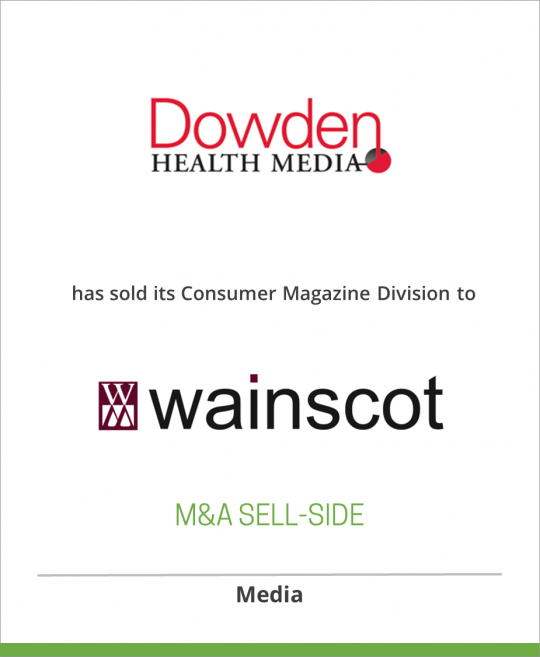 Wainscot Media, LLC, based in Montvale, New Jersey, is a newly formed company that will publish four consumer magazines: New York Spaces, Bergen Health & Life, Monmouth Health & Life and Morris Health & Life. New York Spaces is published for New York’s creative design community – interior and landscape designers, architects, artisans, photographers and writers – and is both a dreambook and a sourcebook (for more information visit: nyspacesmagazine.com). The Health & Life magazines are published for the wealthiest residents of New Jersey’s most affluent counties.